Actually, forget the adults! Christmas is for kids anyway. Or at least that's my excuse just in case. ICYMI I make these bows, among other things, and I sell them super cheap! hits theaters today. As my son is an even bigger fan than I am, we're going to catch it this weekend and inducting my 5yo nephew to The Force. Have you chosen a side yet? Don't forget to follow the hop! My nephew has been going crazy all week about the movie. It's one of his Christmas gifts from me and we are going to see it on Christmas Eve, but he thinks that we are going in January. I can't wait to see his reaction, which will most likely be a bunch of screaming "Auntie you are so awesome!!". Everything is "awesome" or "the coolest thing ever" with him nowadays. Hope you guys have a great time! Oh Braine those are really cool bows!! thanks for the awesome giveaway :) I'm always on the look out for Amazon giftcards to fill my kindle!!! Thanks for sharing! 10 kids?! Holy moly. I could not imagine. This year has been insane for me. I had the bright idea to do homemade gifts for everyone and sometimes those crafts fought back. It was a mess, I was frustrated, and I'm so glad I finished and shipped everything off into the mail. Those bows are so fun. I think everyone has Star Wars fever. I can't wait to see it. For the question in the giveaway I'm not sure what my number one thing is on my wishlist. Maybe the book Illuminae. But I could change my mind. Thanks for the giveaway! Books are always number one on my wishlist! Have a wonderful Christmas ladies and thanks or the giveaway!! I love your new bows, Braine! And as always I'm in awe of your creativity. Keep up the great work! My number one wish list item is a Decodelire bag but I probably won't get one. 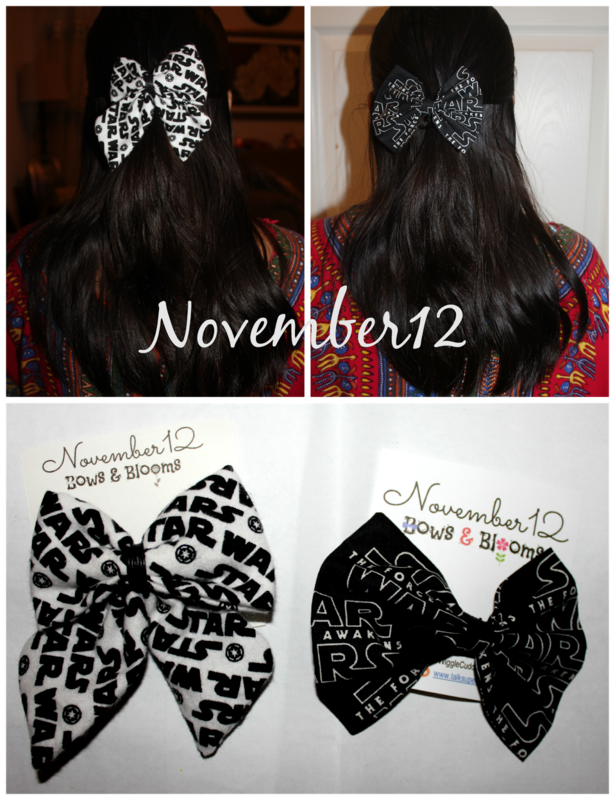 Im going to wait until after next weekend to see Star Wars and I am loving those bows! super cute! I want a new pair of glasses so I can read all these books. Oh, man. There is no "#1" when it comes to my wishlist. The items are all equally important, and I tend to "rank" them by practicality. Except maybe money, which I'm too old to be asking for from people not my employer, lol. I tend to do my gift shopping year-round so I don't have to get elbowed every year in Divisoria. Hope you can finish yours in time! And aw, who cares about sides? The Force is what matters. :D I like the black bow, but I don't think I'm ready to commit to the dark side. Paperback copy of Magic Stars, any of the Reapers MC series books, or Psy-Changeling series except book one since I have that one. Those bows are so awesome! What I'd really like for Christmas is to see The Force Awakens, lol. I think the rest of the family is going to see it on Tuesday, but alas, I have to work. I really want some new boots. I'm not sure what I really want this year, maybe a new ipod? Literally I'm not sure what I want. I would love to receive House of the Rising Son by Sherrilyn Kenyon. money......really.....ok honestly a new PC,but i know that's not going to happen....so i hope i receive enough money this Christmas for the rest of the part's!!! Well, I'd really like a trip to New Zealand; more practically, though, Amazon gift cards are at the top of my list! Tops on my wish list is an iPad! The #1 item on my Christmas list is a trip to the beach. I need a vaca! Books! Thanks for the giveaway! The #1 item on my list is a new food processor. My #1 item was a rechargeable mouse, which I got.